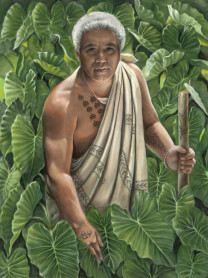 Clifford Neaole, a humble spirit and gracious host, has fostered global understanding, awareness and respect for the Hawaiian culture through his work as the Cultural Advisor for the Ritz-Carlton, Kapalua. 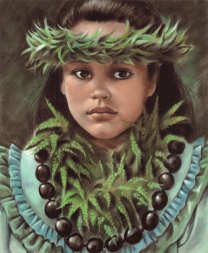 In the image "Forest Dancer," a young girl wears forest fern and ukui nut lei as she prepares to dance at the hula platform in Volcano's National Park on the Big Island of Hawaii. Her beautiful eyes pieced my soul and I wanted to share that moment with you. This is one of my favorite pieces. 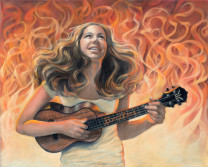 My husband and I had gone up to the summit of Kilauea several years ago to watch Halau o ke Kuhi perform at the caldera’s edge. It was a very odd day. The lava fields had steam rising from every crack and fold, billowing in clouds around us. It was as if the volcano itself was breathing. Little did we know it, but that was the beginning of this latest eruption at the caldera. A few days later part of the fire pit collapsed and a huge tower of steam shot up. 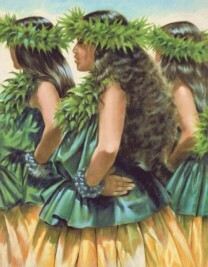 This young dancer in her beautiful traditional pa’u skirt caught my eye. The mist and steam had beaded on her skin and she almost glowed. 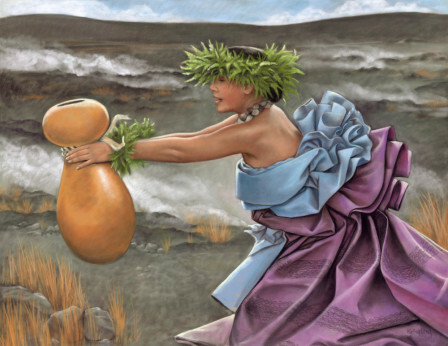 The echo of a welcome chant, or "oil aloha," seems to hang in the air around the young dancer who poses with an ipu heke, or gourd drum, used to make the intricate beats used in kahiko, or ancient hula. 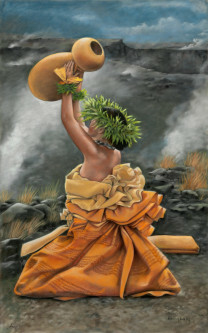 She carries a fan of woven lauhala. 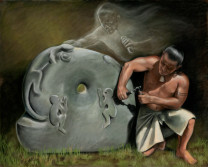 This was the second image in the series of paintings that I did for the Moku O Keawe Festival. The monies from these posters were donated to help perpetuate this great event. 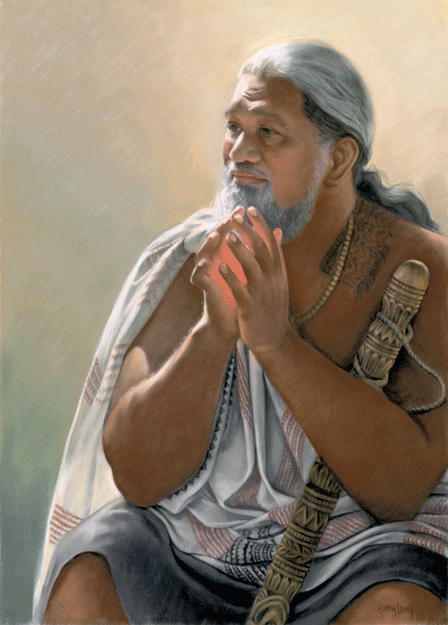 Moku O Keawe was the original name for the Big Island. It means “Land of Keawe” who was the ruling Chief of the Island at the time. In this image I was trying to capture the Big Islands essence. 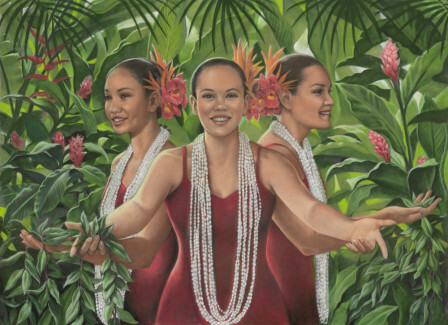 The three dancers represent the mountains Mauna Kea, Mauna Loa, and Hualala’i. 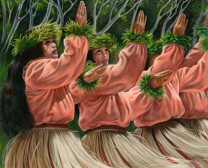 Their lau hala skirts made me think of the waves breaking on the shore or the mists curling around the mountains. A male hula dancer is caught in profile while dancing at the Merrie Monarch Festival. 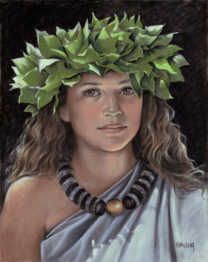 It is said that Laka, goddess of hula, was the first to add grace to dancing, to move to the rhythm of the ocean, or the wind of the trees. 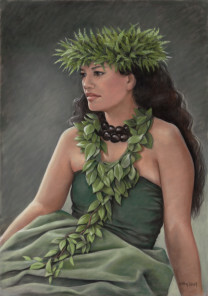 Fern was her favorite lei. 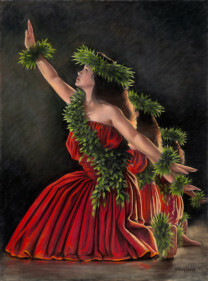 Men, or kane, were the first to dance hula. 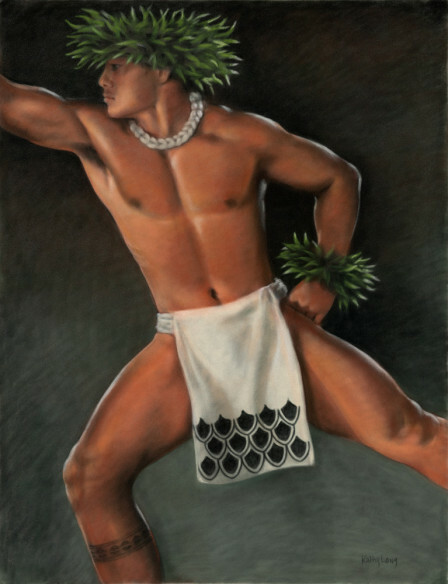 When men started to dance the old kahiko style of hula again, it sparked a huge revival of interest in the Hawaiian culture. 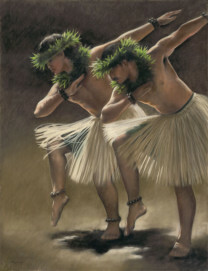 Here, two members of the halau o kekuhi dance in the sun wearing skirts of raffia. This image is special. In October of 2006, the Big Island was hit by a big earthquake measuring 6.7 that lasted almost a minute. Though it was kept quiet do to tourisum, the damage was extensive. Over 60 houses were destroyed, over $200 million worth of damage. But no one was hurt. In "Hula Halau," meaning house of dance, members of Halau O Kekuhi, under the guidance of kumu hulas (teachers) Nalani and Pua Kanakaole, stand ready to dance at the Kilauea Volcano. 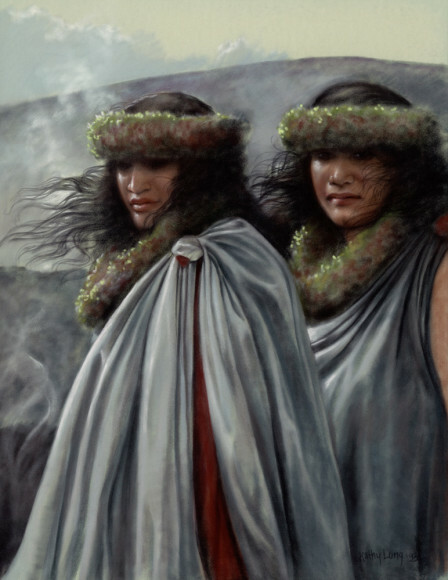 After the death of their month, Edith Kehuhikuhipuuoneonaaliiokohala Kenao Kanakaole, the two sisters joined together to continue passing on their mother's legacy. They hold their home to be Kilauea, and claim ancestry with Pele herself. 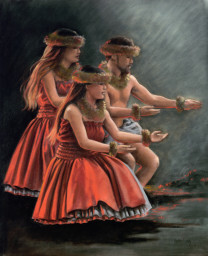 In "Ehu" (red), three members of the Halau of Kehuki, wearing the color of lava that flows from Kilauea volcano, dance at the caldera's edge. While up at the Volcano’s National Park during one of the hula performances on the authentic hula platform we found this captivating child wearing a head lei of Kukui leaves. 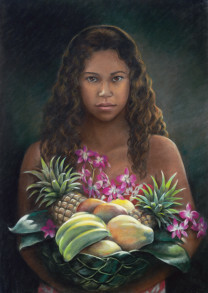 It was noon and the sun beat straight down, highlighting the lei till it shown like a crown.